Combine sauce and honey. brush chicken with butter then with sauce mixture. Covered and grill chicken bone side down, 5" to 6" from medium coals, 15 to 25 minutes, turn chicken. Cover and grill, turning and brushing 3 times with sauce, 15 to 20 minutes or until done. The famous name on this bottle comes from a group of wild turkey hunters, one of whom brought a Special barrel-aged bourbon on their annual hunting trip. In the later years they always requested "that Wild Turkey Bourbon" and today it is still hand-crafted in the same slow traditional way. 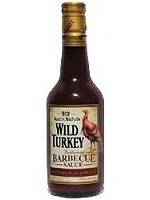 It also perfectly enhances the real Kentucky barbecue sauce, which is made with the finest ingredients. Enjoy 15 oz. Use as a Dip: shrimp, meatballs, cocktail franks, French fries, onion rings, raw or deep fried vegetables. 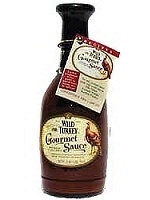 Fish & Seafood Sauce: mix with equal parts of mayonnaise, creamy horseradish sauce and Wild Turkey Gourmet sauce. 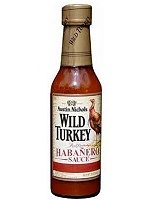 Wild Turkey Habanero Hot Sauce - The famous name on this bottle comes from a group of wild turkey hunters, one of whom brought a special barrel-aged bourbon on their annual hunting trip. In later years they always requested "that Wild Turkey bourbon" and today it is still hand-crafted in the same slow traditional way. It also perfectly enhances this real Kentucky fiery Habañero sauce, which is made with the finest ingredients.